Shop Nova Youth Folding Walker 3 inch Wheels (1 ea. )1 ea. 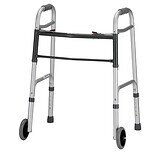 Shop Nova Youth Folding Walker 5 inch Wheels 2 Button (1 ea. )1 ea.